It’s becoming a ritual that is all too common lately. This time the news comes from tiny Keeler, Saskatchewan where the old hotel was lost to fire on July 4, 2017. I remember a local stopping by as we were taking photos and warning us not to go inside because the floor was rotted and there was “about ten feet of water in the basement.” We certainly heeded his advice not only because the floor was missing just steps inside the front door, but also because the roof had caved in making any access more than problematic. Realistically the hotel was little more than a shell with nothing much left in the way of artifacts. By any objective measure, its historical value was minimal and of little interest to anyone other than those of us with a crazy obsession with all things abandoned and historical. For some other views of the hotel and Keeler, I have included a couple other links below. The drive down Highway 42 is going to be a little less interesting without seeing the Keeler Hotel sitting there anymore. One more piece of the past has been lost. 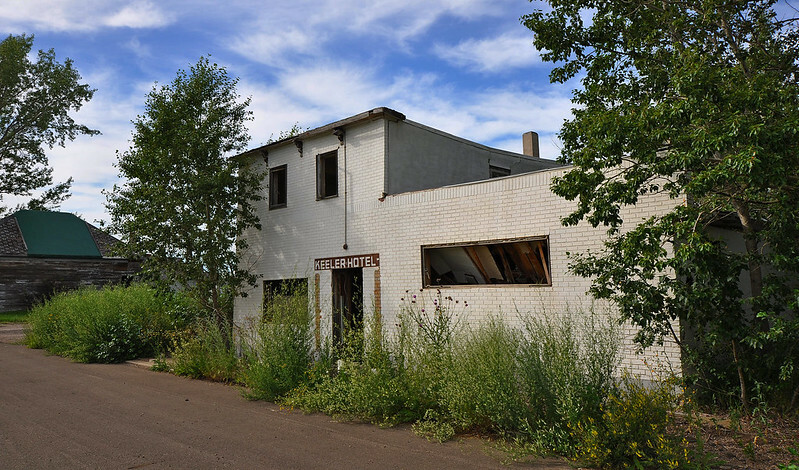 This entry was posted in History and tagged Canada, fire, history, hotel, Keeler, Saskatchewan. Bookmark the permalink. Hi Dan, can you contact. I’m writing an article for the MJ Times-Herald about the loss of the Keeler Hotel. Thank you.